Echo Lines can be applied to Zentangle or doodles, or can be used independently as a beautiful new type of meditative art. What is really unusual about this type of drawing is that although it looks so intuitive and random, the 8 guidelines are very specific. You will be surprised yourself! Wow! People are positively addicted to creating Echo Lines! Eni Oken has come out with yet another well written and well illustrated ebook making something that looks challenging at first glance actually doable with her step by step directions and gorgeous illustrations. Being in ebook format, 3D Tangle Echo Lines is accessible to people around the world with just the click of a few buttons! If you have ever looked at line drawings and wished you could replicate them, then this is your ticket to doing a form of just that. 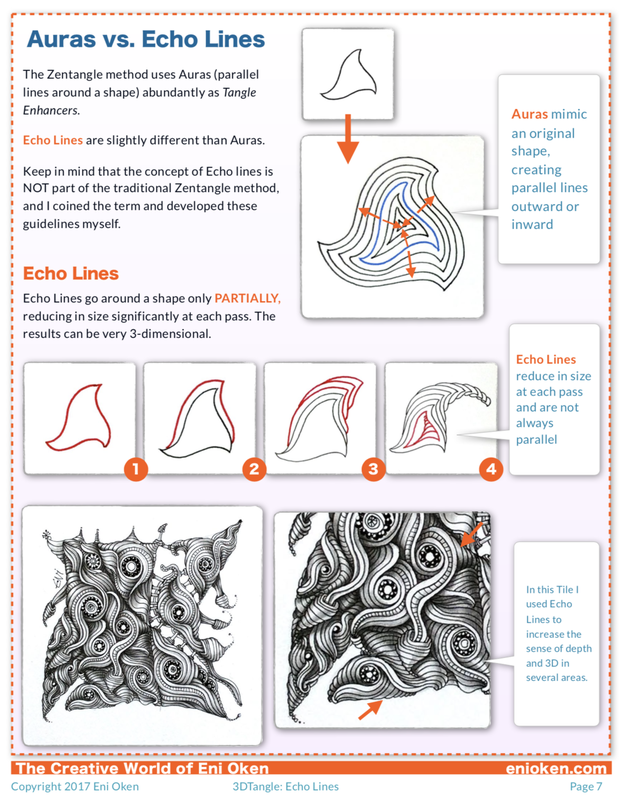 Eni has sections that explain what echo lines are, the origins of her echo lines including a built in glossary, and the difference between echo lines and auras. These are all made easy to understand using both words and illustrations. In order to understand the "anatomy" of her echo lines, she breaks instruction into what she calls the 8 rules. Her ebook clearly illustrates and explains each rule, and provides exercises for each one that can be tried out by as one works through the book. Even though echo lines do not require shading, several ways these lines can be shaded are like an added bonus in this book. 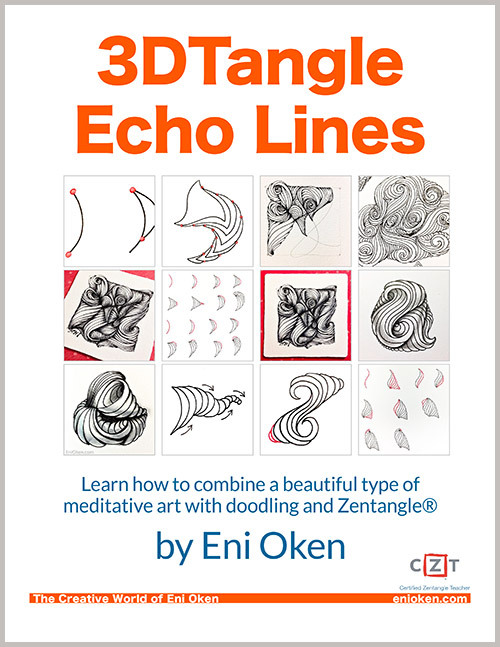 To top it all off, she shares case studies and even provides examples of how echo lines work well with Zentangle®. Beautiful art accompanies every section. This would be a great addition to the library of even the most experienced line drawing artists or tanglers! With a multitude of books on similar topics on the market, in a wide range of quality, this one is sure not to disappoint.